Dog Refusing to go Potty in the Rain: how to get your dog going, even when it’s pouring? Some dogs may have a hard time going potty when it rains outside. This may be due to general fear of water and the sensation on their coats or because the environment looks and smells a lot different to a dog when everything is wet. Some dogs used to living indoors dislike getting their feet wet. If you own a “rain, rain go away or I will not poop until another day” type of dog, you may therefore be looking for some options on how to deal with a dog refusing to go potty in the rain. Dogs share the same genes as wolves and should care less about water, instead here they are acting all worried about rain and getting wet. Well, domestication has really sort of spoiled dogs. If we think about it, animals in the wild must get wet if they want to eat. Domesticated dogs rarely get wet nowadays and fresh meals are served regardless of rain or snow. So getting your dog used to getting wet is vital. A good way to do this is to change our dog’s perception about rain and getting wet. So go grab a garden hose, and weather permitting, let your dog play with the water. Your dog will have lots of fun if you commit to making it as such! Perhaps sing silly songs and toss treats around as your dog gets wet. Squirt the water in different directions and let your dog try to catch the jet. Your dog may be a bit bashful at first, but with time and if you make a great game out of it, he or she will have a blast! Many dogs hate walking on the wet grass. Let’s face it: this is again due to domestication since welcoming our dogs in our homes. Our homes are lined with carpets and tiles and dogs rarely get their feet wet. If we are mopping the floor we tell our dogs to stay off the wet areas. It’s therefore not surprising why dogs nowadays hate having their feet wet. To help your dog overcome the hate of walking on wet grass, you can try feeding your dog on it. Prepare your dog’s meal and get your dog extra eager to have it. Then, if it is has not recently rained, lightly make the grass humid with a garden hose and place his food bowl there. If your dog is hungry and eats, he will start to associate wet grass with food, or at least will learn that wet grass is nothing to worry about. Not many dog owners are aware of the fact that walking dogs stimulates them to eliminate. Take your dog for a walk in the rain. Sooner or later the urge will come. It may take an hour walk to less than thirty minutes until he or she may go potty. It may be tough at first, but they will pay off as your dog gets used to the sensation of rain and that he is capable of going potty when it’s raining. With time, he should become more and more comfortable and should take less to go potty. Tis really should be avoided, as the dog may get too used to the umbrella and depend on it. However, if you are looking for short cuts this may work. There are now special dog umbrellas that can be mounted to the leash and that allow dogs to stay dry on walks. Doggy boots may be helpful as well for dogs who hate walking in grass or puddles. Some dogs prefer to wear a doggy raincoat. But be aware: should one of these items be missing, your dog may go back to categorically refusing to go potty. This works sometimes. If you hear the noise of rain outside delay your dog’s potty time. Let’s say instead of 9 PM let your dog go at 10:30 PM. It is a good sign when the dog is going back and forth towards the door whining. Then once out, he or she may be upset because of the rain but the urge may have grown so much that they could care less! Some dog owners may have success installing special tarps in their yards so that some areas remain dry. Dog owners who have outdoor kennels may cover the kennels with a tarp so that their dogs can be kept in the kennel until they feel comfortable to go potty. These tarps come also handy in keeping parts of the yard free of snow. To keep your dog focused on the task despite rain, snow or location, it can help to train your dog to go potty on command Make sure to create strong associations with the verbal command you use through the use of super tasty treats and your dog may soon be on his way to go potty as soon as he hears these words. If you train this very fluently, the act of going potty may become almost reflexive, with your dogs going potty without much thinking involved! Rain can become your dog’s best friend if you allow your dog to gradually get used to it. If feasible, take your dog out on walks when it rains on mild summer days. Make it fun! Of course, avoid this when it is cold! 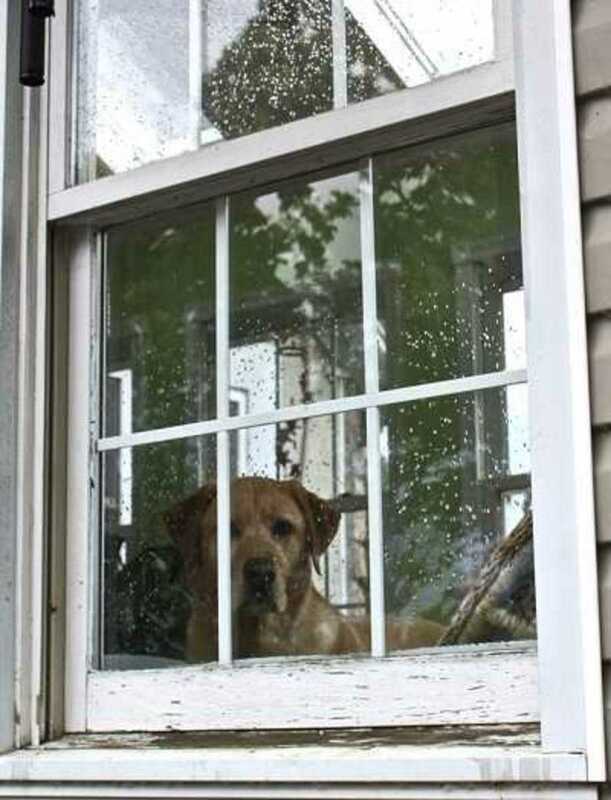 Sooner than later your dog will become accustomed to the rain and may even ask to go out and play with it!